A preacher (left) and a conspiracy theorist (right) in GTA IV. 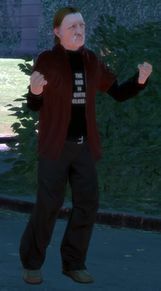 Soapboxxers refer to specialized pedestrians in Grand Theft Auto IV whose primary function is to stand in designated areas of Liberty City and soapbox about their thoughts, be its religious preaches, conspiracy theories or simply outlandish expressions of their thoughts. 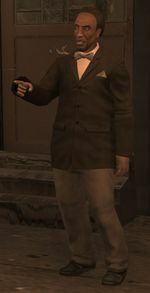 Soapboxxers in GTA IV are generally classified into two groups. The first are African American preachers who constantly warn about doom for humanity. They appear to be rather eccentric but delusional, their statements often lacking factual basis. Even so, they believe that what they're saying is true. They are most likely a play on the "bible belt" fundamentalist preachers who often come into large cities (such as Washington, D.C. and New York City) to preach "the good word" to anyone passing by. There are a variety of randomized character models of preachers, each with their own view on what hell is in store for those who are nonbelievers and heaven that those who believe will go to when they die; a handful of preacher may also hold what appears to be a religious book, but close inspection reveals it is simply a book also held by generic pedestrians. The other form of soapboxxers are Caucasian American conspiracy theorists who attempt to spread far-fetched conspiracy theories relating to the government and criticize the seeming conformity of society. They warn of how corrupt the government is (specifically, that of the United States) and how the government spies on them (stating on one occasion, for example, that the government has put "robots" into the drinking water). On other occasions, they tend to express they wish for a conspiracy-free society, and their unconditional love of everyone. The locations of both soapboxxers are usually the same, with both characters interchanged during certain times when the player passes by the same location. Common locales predominantly include landmarks in Algonquin, such as the Suffolk church, Star Junction, the Algonquin end of Broker Bridge, Middle Park, hospitals, and opposite the South Bohan Safehouse. They also both appear in front of the chapel Alderney State Correctional Facility prison yard (although it is probably meant for preachers to only spawn here). A soapboxxer being berated by a gathering of pedestrians in Middle Park. Soapboxxers are often looked down upon by passing NPC pedestrians, who usually abuse them verbally. Despite receiving constant insults, soapboxxers tend to continue on with their soapboxing, and may often be heard looping the same preach over and over again. The only way soapboxxers can be silenced is if the soapboxxer is threatened with a weapon (with a weapon aimed at them), or is physically attacked by the player or NPCs (i.e. via punches, a weapon, or a simple vehicular accident). If the soapboxxer manages to survive the initial onslaught, they will stop their preaching and attempt to flee or fight back. This page was last modified on 14 June 2011, at 02:06.